Terry Baxter is a never-say-die Hollywood newcomer from Waterfall Kansas, determined to make it big. And does she have talent. Filled, of course, with lots of musical numbers that showcase her many talents. Here is top-billed Ann Miller with blonde hair. I really studied her in this film, and I don't think it's a wig.It must have taken gallons of peroxide to get her black hair blonde. Miller provides her usual snazzy tap dancing. This film has peppy music, although none of it memorable enough to be included with "standards", or even memorable enough to have survived into present day, even though the composers were top-notch talent. Miller, Johnnie Johnstone and Betty Rhodes provide the vocals, with a little bit of Jerry Colonna's nonsense. Vera Vague, the character created by Barbara Jo Allen, is listed in the credits under the character's name. Vague is the ditzy man-hungry ugly duckling, as the girlfriend of leading lady Rhodes. 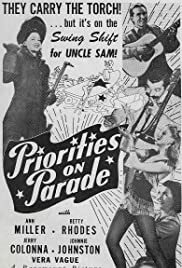 The plot is topical for 1942 World War II: patriotism, war-effort, swing music, and with the usual boy meets girl, boy loses girl, boy gets girl in the end story included. Is it a "B" picture? Maybe, although it's a big too long for that category, but with lesser talents making up the cast, perhaps not an "A" picture, either. It would be an interesting project to research old newspaper advertisements to see how it was presented.